The first thing we heard about Super Ling was that it was “Chinese...ish”. Which sounds like a cookie without a fortune (or maybe the other way around). Turns out it actually means Chinese-Asian fusion—a few spices from Malaysia, a little borrowing from Hong Kong, Taiwan and Singapore. Some chef-y creative license from kitchen whiz Michael ‘Super Mike’ Li. 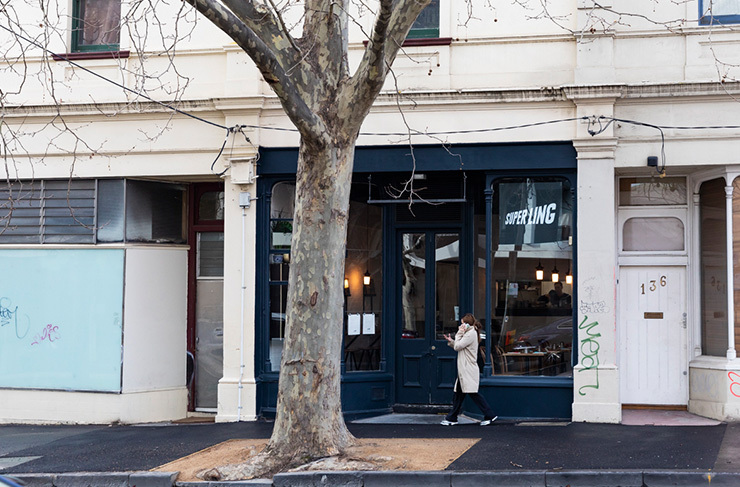 Super Ling is a discreet little Asian diner that’s opened on Queensberry St, just near the Lygon intersection. It’s cosy, fun, and probably our favourite low-key opening this year (it’s gonna be hard to topple Lesa and Navi, but both of them are high-key and proud of it). This one’s the project of Iain Lang, the guy that owns Hotel Lincoln down the road. In the kitchen is Michael Li, whose resume reads like a who’s who of the crème de la crème in Melbourne dining—Lee Ho Fook, Restaurant Shik, MoVida. One bite of his food and we could see how he got the ‘Super Mike’ nickname. Hot damn this guy can cook. The fit-out is probably exactly what you’d expect from “Chinese-ish”. There’s white-painted walls (Iain and his mates did the whole paint job themselves), stylised Bruce Lee posters, Jackie Chang photos, clean-line bench seating running down the right-hand side. You’ll be happy to know Melbourne’s got over its Edison bulb fetish—Super Ling uses utilitarian glowing cylinders instead. Here’s the best way to tackle Super Ling. First, gather a small and intrepid band of friends, maybe two or three people max. There is a bigger zig-zag table in the middle of the restaurant, but there’s not a lot of room for more (the venue only seats 30 hungry punters). Start with a plate of the Mopu Tofu Jaffles. Now when we heard a Chinese restaurant was doing jaffles, the sceptical eyebrow was definitely up. It sounded like hipsterism gone rogue – but at Super Ling, these things totally fit. For starters, they’re not the schoolyard triangle jaffles you’re used to. 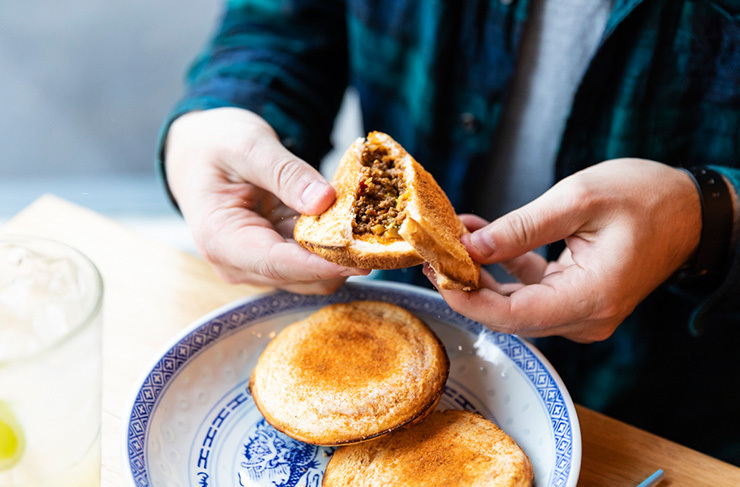 They’re more like circular hockey pucks – toasted nicely, dusted with chilli powder, and stuffed with a brain-blasting mix of Sichuan minced pork, fermented bean paste, soft tofu and more chilli. They’re basically Super Ling on a plate: a bit unorthodox, kind of weird, but damn if you’re not licking every finger and asking the waiter for the recipe. After that, it’s kind of up to you. Most of the dishes are good for sharing, but you could hog a whole bowl of the steamed barramundi with chilli and peanuts to yourself (another dead-set winner). Make sure you also order a side of the fried broccoli with pickled stem and a good fistful of garlic. This thing could fight Dracula, convert kids to greens and cure your cold, all at the same time. Goes great with the Moy Choy pork belly on mustard greens (turbo-charged with a little red chilli paste). The Lap Cheong fried rice arrived a bit Marilyn, but the flavour was still great, studded with Chinese sausage, egg and spring onion. Half the fun was trying to pick it up in Super Ling’s kitty-topped plastic chopsticks. The booze menu is pretty trimmed down at the moment. There’s exactly one beer, one rice wine, one sake (we were told there’s more on the way) and about eight regular vinos. Most of them natural. But if you’re looking for a deeper cellar, the waiter will run down to Hotel Lincoln and grab a bottle of wine (legit, they keep the full Lincoln wine list at Super Ling for exactly that purpose). Most of all this place is fun. And it straddles so many occasions. First Tinder date? Super Ling would crush it. Lunch with the in-laws? Super Ling can handle that too. Catching up with mates? Just bulk order the steak tartare and you’re good to go. The tricky bit is going to be getting a table on Friday nights—this place has been getting a lot of press. Err, yeah, sorry about that. Want to learn more about Super Ling? Check out our Directory page.